-Below is a link to a review of “Bataille de Sang”-a short, silent, black & white film by THE HORROR OF IT ALL. The film is set to debut at TERROR EXPO in Johnson City, NY on October 9, 2016. I play the role of Dracula in this-who battles the vampire Marquis DeBlood (Mark Dickinson). 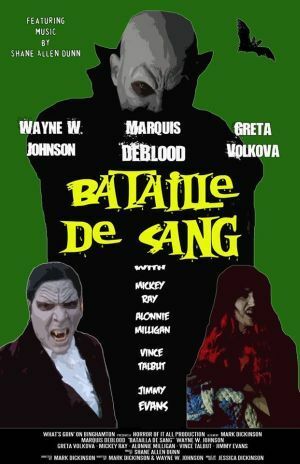 This entry was posted in REVIEWS and tagged Bataille de Sang, black and white film, dracula, horror, horror film, horror movie, johnson city, Mark Dickinson, Marques DeBlood, NY, Reviews, short film, silent film, Terror Expo, vampires, wayne w johnson, WWJ. Bookmark the permalink.